Face it, this band reinvents itself with every album. No two are alike, and The Art of Dying is no exception. Both bright and dark, heavy & light. Pulsing with vibrant anthems, startling social truths, progressive and confident musicianship. This is the total package--a little something for everyone. Strong song writing, metal guitar work, outstanding drum bombardment and a bass guitar that you can hear. Vocally and guitar driven, it’s the unique, fluid balance between the two that is what makes this such a strong metal record. Guitars provide plenty of chord progression, and enough trick bends and slides to keep you guessing. Vocal delivery, with shared harmonies mixed in, provide even more melodic hooks. I have to say the sheer personality that comes through, from everyone, is nothing short of amazing. No one’s hogging this show. Death Angel has so much more to offer than fast paced thrash aggression, they capture strong chemistry and prove once again how under appreciated they are. The disc opener is a classically influenced guitar instrumental. Then you’re “Thrown to the Wolves” with authority. Menacing guitar work, fast tempo, taking its precious time getting it’s groove on, and fierce hooks into you. Extended soloing and anthem lyrics make this possibly DA’s best song ever. Classic thrash based song, with instant impact. “5 Steps of Freedom” doesn’t cool the momentum rolling--another anthem has been written. It’s got rock sensibilities, funky groove break down, excellent leads, spacious guitar work, vocals that push the limits, and again… the precious hook. “Thicker Than Blood” has a goddamn Motorhead vibe to it, fast paced, scorching solos and leads that just go on and on. Sinister guitar picking start “Devil Incarnate” off slowly. Right here is where you get “something for everyone.” This has definite radio appeal. Vocals weave vindictive lyrics through the song, “I will survive while you die” ring loudly, long after the song is over. Mid paced overall, ‘til the end, where you’re given a thrasher ending. “Famine” shows off rumbling bass lines and guitar work to make this one another slow burning rocker with a thrash ending. “Prophecy” has menacing and fading in and out guitar lines to open this one up. Then you’re sucker-punched back into a fast-paced thrash song. The trickery of this CD! What is this disc? A rocker, or a shredding guitar feast? Both. “No” has a delicate balance of rocking and thrashing. The lyrics kick this one in high gear with a resounding statement about following trends. Don’t follow them, musically or personally. “Spirit” is sung by Andy (drummer) with great emotional weight. Isolating the music alone, it’s a fast-paced thrash based song, while vocally it conjures up far different eras. To me it has an early ‘80s attitude to it--a very different song for this CD. “Land of Blood” (sung by Dennis) works very well with a different singer. It’s got a fun punkish atmosphere here and there (as do the previous two songs), with hard-hitting guitar leads and solos. “Never Me” has excellent, complicated lyrics, heavy tones, bass lines popping out everywhere, made complete with an absolutely incredible solo, emotive and gracefully placed. “Word to the Wise” is a three-part stunner. Acoustical and electric guitars are the beginning and the end. Seamlessly pieced with a mid section that’s hard enough to push the lyrics home. Forget thrash for a minute, since this isn’t really a thrash recording. The Art of Dying has some elements that remind you of thrash, heavily sprinkled throughout. And it’s not Act III either. TAOD has little of the funkier qualities of Act III, but just some. The Art of Dying is simply a great metal record. I’ll go out on a limb and say that this has wide appeal to anyone that likes metal. Every song is so different from the rest, it’s like three records in one. Any one song may affect you differently every day, and that’s a great record. The one that you play, and replay, and find something that you didn’t hear or appreciate before--all the while, grabbing a new favorite from it. (Believe me on that last line, I’m listening to TAOD as I proof this for errors.) 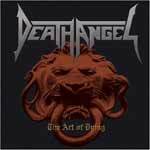 If you have followed Death Angel, and have stayed a fan, you will love this. If you’re not, take a chance on The Art of Dying. It’s a lesson in living with outstanding to great songs. I find it the perfect mix of everything they’ve done before, with solid footing in the here and now.